$99 Per Person + Free Drink! This offer is temporarily unavailable. We expect it to be available again by March 2019. Please check back! 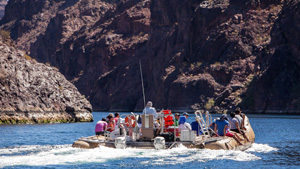 Coupon Specifics: Coupon good for a $99 per person Hoover Dam helicopter & river rafting tour. To redeem this coupon call (702) 736-7243 and mention the coupon code V4LHDR or Book Online. Limit 4 people per coupon. 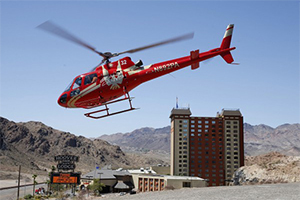 At check in each passenger will receive a voucher for a complimentary drink at the Hoover Dam Lodge! May not be combined with other offers. No cash value. Lift off from Hoover Dam Lodge on this unique helicopter & river rafting tour that includes amazing views of Hoover Dam, Lake Mead and the Colorado River. The air tour portion of this experience features in-flight narration and covers approximately 10 miles in the air flying about 2,500 feet above the Hoover Dam. Return to the landing site and check in at the Hoover Dam Lodge for the rafting portion of the trip where a shuttle awaits to take you to the base of Hoover Dam. 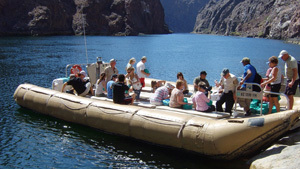 There, you’ll board a motorized raft with an experienced guide for a 30-minute float trip on the Colorado River! To book this deal call (702) 736-7243 and mention the coupon code V4LHDR. *Daily departures except Thanksgiving Day, Christmas Day and New Year’s Day.